Due to the predicted rain, Oakland is postponing its First Fridays Street Festival, which was supposed to take place this evening. Art galleries and other indoor First Friday events will still be happening, but street performances and vendors on the streets have been cancelled. Tonight's event was themed “Art is Women”; instead, the plan is to move the street festival to next Friday, March 9, in what's being dubbed "Next Friday." 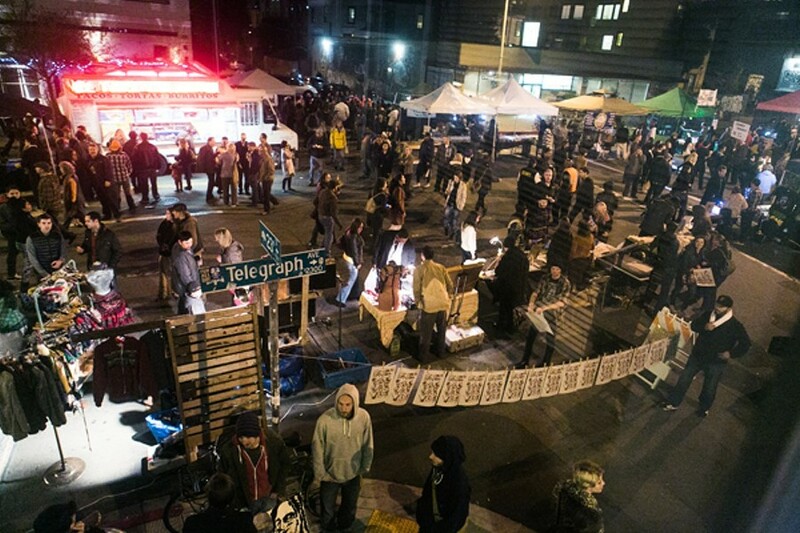 “By doing so, we are able to preserve the spirit of Oakland’s art community even when the festival is rained out on First Fridays,” wrote marketing director Alicia Rivera in an email. “Next Friday” will be the first-ever rescheduling of the festival due to weather circumstances — a tactic that will continue in the future. March's "Next Friday" will pay homage to International Women’s Day, focused on giving recognition to the women who make First Fridays happen. The festival will feature local artists, food makers, performers, and retailers run by women in the Bay Area. was fatally shot five years ago; SLATE Gallery is introducing its new exhibit, “Modern Landscape: Exhibition walk-through with curators and artists”; and the brand-new Ashara Ekundayo Gallery will host a reception for its first exhibition, Obvious Magic. For more art gallery shows in Oakland, click here.